THE EPO is mentioned a lot in Juve’s November edition, which is available for free online. Benjamin Henrion said it contains a “UPC must read” — the part which we alluded to earlier this morning (death of UPC). The edition contains a 5-page article about the likely end of UPC (German impasse), another article about UPC and Brexit, and a 6-page interview with Dr. Ernst (who recently replaced Jesper Kongstad, the man who immediately entered the private sector unlike EPO employees). There is one more article there which is less relevant to us. By all means, EPO workers should consider reading Ernst’s views on Battistelli. It may matter a lot in the coming months/years. Sometimes it feels like Battistelli intentionally takes away holidays, various contract benefits and job security just to anger the ‘expensive’ EPO staff, causing such staff to leave (rather than be fired) and give way to ‘cheap’ staff that would not flag decline in patent quality. It’s like Battistelli wants another INPI while pursuing SIPO-level patent quality. @schestowitz It's true that we have sought interviews with AMBA (not specifically on UPC) and permission was refused by the EPO president. In July, the European Patent Office reformed its Boards of Appeals. This reform must be implemented by the beginning of 2017. To achieve this, a President of the Boards of Appeal has to be found. Critics complain that the reform will not give the EPO Boards enough independence. 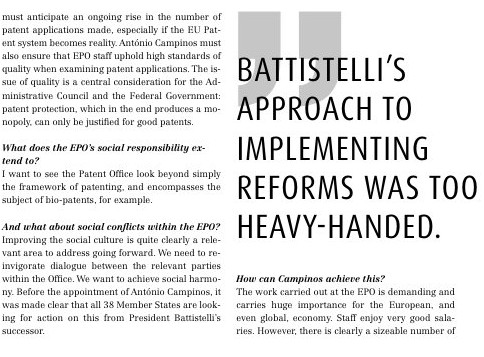 In this JUVE interview, EPO President Battistelli gives his view and explains why patent renewal fees will not necessarily reduce if the UK leaves the EU and, with it, the new European patent system. We gave a sort of translation of the mirage of independence for the boards. AMBA later refuted that as well. Regarding the UK, it does not have to leave the EPO if it leaves the EU as the EPO is not an EU organisation and it includes several member states outside the EU. JUVE: The Administrative Council and the Office describe the reform of the Boards of Appeal as a milestone for the strengthening of status, efficiency and sustainability of the EPO appeal system. Why? BENOIT BATTISTELLI: The reform is pioneering because attempts at a structural reform have already failed twice, in 1995 and 2004. The Administrative Council gave the Office the mandate to develop a reform proposal which was within the boundaries of the European Patent Convention (EPC). This allowed, in spite of the scope of the reform, a fast implementation. Because otherwise a protracted process would have been needed, including a diplomatic conference and ratification by the parliaments of all 38 member states. What he is trying to say is, suddenly he cares about the EPC, even though we showed many times in the past that Battistelli arrogantly defies the EPC. What “fast implementation” means in this context is a forced implementation that does not allow much time for discussion and potentially resistance (same as in patent appeals). It’s just autocracy. To him, diplomacy is just a nuisance that needs to be overcome. We have seen a lot of this in the UPC. JUVE: What have you achieved? BENOIT BATTISTELLI: The Boards of Appeal play a very important role in the European Patent System. The reform shall emphasise that and ensure the sustainability of the EPO appeal system: it strengthens the organisational and managerial autonomy of the boards, the perception of their independence, and their efficiency. In addition, a series of measures will be introduced, that will allow the Administrative Council and the future President of the Boards of Appeal to improve legal proceedings for the parties – for instance, by shortening process times and making the appeal procedures more consistent. In reality, all that’s being achieved is shrinking of the appeals body, less opportunities to appeal (not to mention less time), higher financial barriers (for access) to appeals and no substantial separation at all, given that Battistelli is, according to Board 28, continuing to attack a judge. JUVE: Nevertheless, not only EPO Boards of Appeal members have criticised that the emphasis has been too much on efficiency and less on the independence of the EPO Boards. How do you respond? BENOIT BATTISTELLI: The independence of the Boards of Appeal is clearly incorporated in the EPC, and their role as an independent judicial institution has always been recognised by the highest European and national courts. Therefore, the reform shall primarily improve the perception of independence. To achieve this the current DG3 will be restructured into a Boards of Appeal Unit with its own President. The President of the Boards of Appeal will be given tasks and powers which have been delegated to him by the President of the EPO. As far as management duties are concerned, he is only answerable to the Administrative Council. This is a substantial change. This is because as well as improvements to independence the President of the Boards of Appeal shall also increase the efficiency of the Boards of Appeal. When Battistelli alludes to the EPC he basically admits that he violates it. Why? Because it’s abundantly clear that he has not respected their independence and continues doing so. He keeps speaking about “perception of independence” perhaps because he knows that he wants to give them no real independence; he’s faking it. JUVE: Why is this at all necessary? BENOIT BATTISTELLI: The current backlog and the protracted length of the procedure need sorting out. The continuous increase in litigation in the last couple of decades is, however, in no way only limited to the EPO Boards of Appeal. However, it is necessary to confront this situation with appropriate measures. In other words, quality control is a nuisance to Battistelli because it means that the whole process is slower and there is a queue. God forbid! He acknowledges an increase in litigation, as though this is desirable or somewhat of a given. So in short, speed and raw quantity (quantified using a dumb politician’s yardstick) trump quality now. It’s quite evident from what he is saying. JUVE: By having, with the new Boards of Appeal Committee, a joint right of proposal for the new President you will have further influence on the Boards of Appeal. Why is the participation of the EPO President at all necessary in this matter? BENOIT BATTISTELLI: It is stipulated in the EPC that the Chairman of the Enlarged Board of Appeal shall be appointed by the Administrative Council upon a proposal by the President of the Office. According to the reform, the Office President and Boards of Appeal Committee shall jointly propose the President of the Boards of Appeal, who will be delegated managerial responsibilities. In this way the President of the EPO will share the right of proposal with the Committee – currently he alone has this right. This will allow the President of the Boards of Appeal to lead his unit without influence by the management of the EPO. Given that the Administrative Council is almost in bed with Battistelli (hardly overseeing him at all), and given the track record of bad faith from both, it seems apparent that the above answer is lots of hogwash and hot air. JUVE: Once more: why, as Office President, will you continue to participate in these matters? BENOIT BATTISTELLI: At the end of the day the President is legally responsible for ensuring that the whole Office functions in a proper way, including the budget. Hence, he must be able to trust that the person that takes over his powers exercises them properly. The decision to appoint the President of the Boards of Appeal lies, anyway, with the Administrative Council. …which in itself is somewhat in the pocket — some believe almost literally — of Battistelli. JUVE: When will you delegate your powers? BENOIT BATTISTELLI. As soon as the President of the Boards of Appeal has been appointed I will be able to sign a document to transfer powers. One can safely assume that Battistelli will have veto power and can therefore ensure that the person is subservient or obedient to begin with. JUVE: Has it already been decided who the first President of the Boards of Appeal will be? BENOIT BATTISTELLI: He shall be appointed by the Administrative Council before the end of the year. It is planned that he will take up his duties when the reform comes into effect in January 2017. Notice the word “he” (maybe an artifact of translation from German). Given the lack of diversity at the Office, it would not at all be surprising if the person turned out to be white male, possibly French and right wing. JUVE: In the future the Office and the Boards of Appeal shall be separately housed in Munich. Has there already been a decision over the future location of the Boards of Appeal? BENOIT BATTISTELLI. Negotiations with property owners in Munich are already very advanced and hence the decision can be made in October. They already decided, but they are playing a game here. JUVE: The disciplinary procedure against the judge that you suspended has still not been concluded. In June the Enlarged Board of Appeal deviated from the recommendation, by the Administrative Council, of dismissal. By October Jesper Kongstad, Chairman of the Administrative Council, has to draw up a proposal as to how to further proceed. According to the statutes he has to propose that the judge be reinstated. You wouldn’t favour that? BENOIT BATTISTELLI: According to our Convention the Administrative Council has disciplinary authority over Boards of Appeal members, while the President has the power to suggest disciplinary measures and furthermore carries total responsibility for the proper functioning of the Office. In the case in question the Council decided in December 2014, because of the knowledge of serious misconduct, to suspend the Boards of Appeal member from service. After the submission of an extensive investigation report the Council, in March 2015, initiated a disciplinary procedure. Under the chairmanship of a former ECJ judge, a disciplinary committee, which also had members of the EPO Boards of Appeal and experienced external lawyers, came unanimously to the conclusion that the serious misconduct of the Boards of Appeal member demanded his dismissal. In decisions in June and October 2015 the Council followed this review and requested that the Enlarged Board of Appeal submit a proposal for dismissal. However, almost a year after this request the Enlarged Board of Appeal decided to not follow the request, because I pointed out that at the EPO disciplinary proceedings are confidential and cannot be carried out in public. These are the facts. Let us be clear: this isn’t about personal sensitivities, but the integrity of the appeal system at the EPO. Complete nonsense. Battistelli’s lips just move a lot. Regarding confidentiality, it’s quite likely Battistelli and his goons who leaked smears to the media in order to defame the accused, making the Office look worse than bad, one might even say “corrupt”. A short time afterwards they began attacking me too — all this shortly after they had signed the FTI Consulting contract that was later expanded to dominate Dutch and German media (separate from the EPO’s payments to media giants which soon turned into EPO mouthpieces). JUVE: The Brexit decision endangers the start of the new European patent system. The EPO is involved in this system. What chance do you see that the Unitary Patent and hence the whole system will start in April 2017 as planned? BENOIT BATTISTELLI: The EPO hopes to find a solution that lets the Unitary Patent come into force as soon as possible. It is here crucial that partaking member states ratify the Agreement on a Unified Patent Court. After the referendum the Dutch parliament agreed to ratification and so sent out an important political signal. Independently from the political decisions it can be assumed that the system will come, albeit very probably with a delay. The work is, however, far too advanced, and has generated too much positive momentum, for it to be shelved. No, the UPC is almost certainly dead (in its current form), if not just in the UK then in the whole of Europe. They’ll probably try to repackage it and maybe even rename it again. This can take years and there’s no guarantee anything will come out of it. In the mean time, the EPO is rotting and there's expectation of layoffs within a couple of years if Battistelli's vision gets implemented. JUVE: If the UK can’t take part in the system will the renewal fees for the EU patent have to be recalculated? BENOIT BATTISTELLI: It is too early to estimate the impact on the renewal fees for the Unitary Patent. They have been so determined to correspond to the sum of the renewal fees for the four countries in which classical European patents are most frequently validated. This so-called “Top 4” solution was preceded by very long and difficult discussions of the member states. By the way, the level of the fees was already decided before the accession of Italy and wasn’t increased afterwards, because the member states didn’t want to reopen the debate. This could also be the case if the UK leaves. Finally, the model would even then still offer excellent value, because it would give patent protection in a multitude of EU member states at a very attractive cost. The patent trolls would certainly love it, but again, why assume this can ever happen? Why suppose an inevitability? The UPC is about as dead as the EU Patent or Community Patent, which several years ago we were told were inevitable and only a matter of time. Remember Charlie McCreevy‘s and Michel Barnier‘s lobbying for this? The latter, incidentally, became the key person in Brexit negotiations. “Depends which lawyers one asks,” I replied. Patent lawyers (especially those who invested in UPC) are not David Allen Green, who writes a lot about Brexit these days (one of the most prominent commentators on the subject in the UK). Incidentally, David Allen Green is the person who defended me from several vicious attacks from the EPO. It becomes thus clear that the Brexit is on its way. Any ratification before this date has been transferred to dream world….. 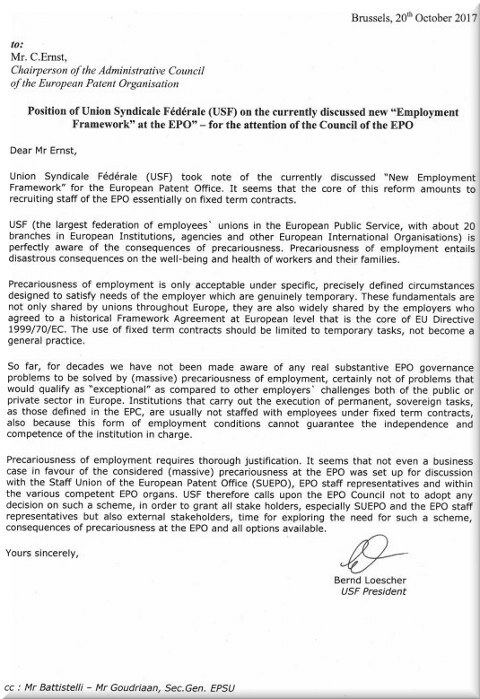 Earlier today we explained why the Council's statement serves to disprove the narrative floated by Battistelli’s EPO. We are still unable to actually see/read what Battistelli told Managing IP (we’ve even tried Google cache, to no avail) because the original is behind a rather stubborn paywall. All paywalls, whether by intention or not, are a tool of soft censorship or limitation of access by particular audiences. They can help ensure that one only preaches to the choir and can hear back from the choir (patent lawyers in this case) because it’s hard if not impossible to examine what was said, especially as an outsider (to the microcosm) cannot become aware of what was actually said internally. It’s like a closed event/conference/meeting. Maybe like EPO-organised events which are either expensive or invite-only. It becomes an echo chamber. Managing IP has just published some blog post with afterthoughts about this interview. These are publicly accessible, so we can examine and rebut what is essentially a sort of roundup. “Battistelli is either deluded or he simply hopes that repeating this lie will help it stick (in the minds of those who are desperate enough to believe it).”This is nonsense. It’s a delusion. Battistelli is either deluded or he simply hopes that repeating this lie will help it stick (in the minds of those who are desperate enough to believe it). Funny that EPO management worries about “private practice firms” in the boards when the management itself seems to be guilty (more on that in an upcoming series). 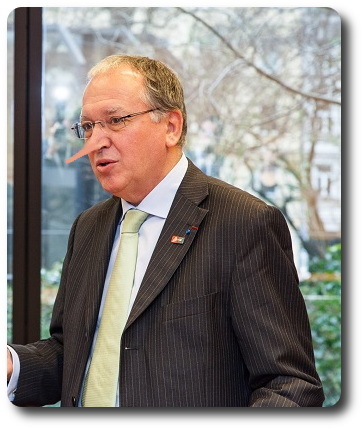 “Notice how Battistelli basically paints himself and the management as the “victims”.”“Battistelli acknowledged that the reputation of the EPO has been damaged by recent criticisms,” according to this blog. Well, that’s his fault. He blames the criticism rather than what the criticism is about/against. Notice how Battistelli basically paints himself and the management as the “victims”. Imagine the NSA painting itself, not the people whom it illegally spied on, as the victim. What a terrible PR strategy. The “recommendations of the disciplinary committee” are basically a shadow of whatever Battistelli wants. It’s a mock trial, which Team Battistelli keeps trying to make secret not because it jeopardises the so-called ‘investigation’ because it embarrasses the accuser and shows what a laughable ‘trial’ is really happening (we have access to the texts and we have already refuted some ludicrous parts). Complete nonsense! The so-called ‘harassment’ case is suggestive of the Hardon case, where something which happened almost two years ago suddenly (magically!) becomes relevant because Battistelli is determined to crush the unions by any means possible. If people want the hogwash, Managing IP will quite likely provide it. Provided people are willing to pay Managing IP for access to pro-patents (or patent maximalism) articles.